Splitboard 101 Tuesday, December 11th. Join us for a talk with Weston Snowboards ambassador Ryan Frank from 6pm-8pm. This is a great event for those interested in splitboarding as well as seasoned veterans looking to make some new shred partners. Here at LB Snow we believe getting into new outdoor activities should not feel so intimidating and we hope these events will provide a communal jumping off point for your next adventure. This is great chance for folks to learn how to choose a splitboard, what the necessities in the backcountry are, and what avalanche training you will need and where to get it. Folks will also learn some tricks of the trade and have a chance to see what LB Snow will be carrying in the splitboard rental department. Everyone who comes will also get a token for 50% off a splitboard rental package. As always there will be free beer and pizza provided by our friends at Draughtworks Brewery and Pie Hole Pizza. We will also have deals on Avalanche safety equipment and some other surprises. Choosing your first splitboard and bindings. Basic trip planning utilizing local avalanche forecasting and online mapping software. Bring in your used winter gear. Check out our consignment page online for details. 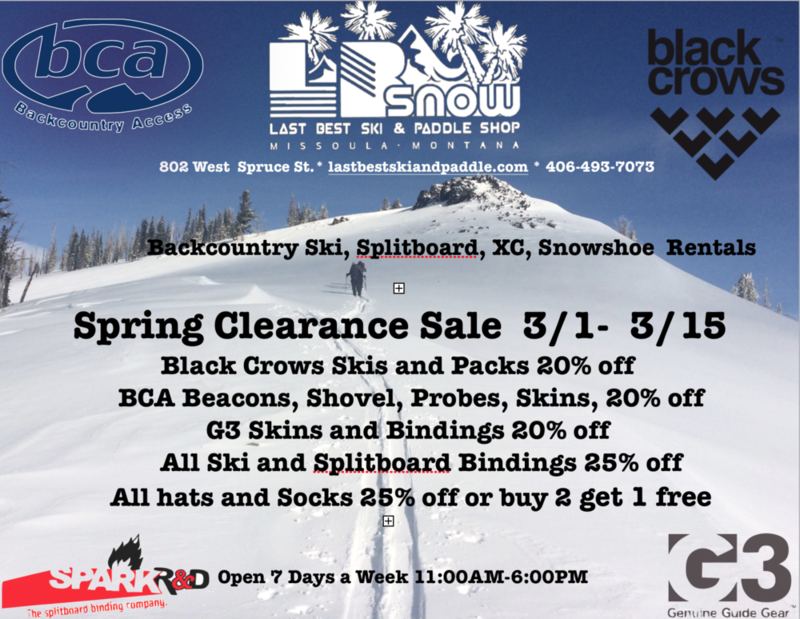 LB SNOW INVITES CONSIGNERS TO SELL NEW AND USED GEAR AT OUR ANNUAL SKI SWAP! DROP OFF CONSIGNMENT ITEMS ANY DAY PRIOR TO EVENT. LB STAFF WILL HELP YOU PRICE THE ITEMS FOR THE BEST SALE POSSIBLE. ALL ITEMS CONSIGN FOR AN 80% RETURN AND A 20% FEE. PICK UP UNSOLD ITEMS ON SATURDAY NOVEMBER 25TH. LB SNOW will be hosting Elliott Natz, an adventure photographer on Nov 2nd, 2018. A fun evening with snacks, beverages, and visual art to celebrate local artists in Missoula.